One of the clear benefits of having a longer season is that Star Wars Rebels is able to tell the smaller stories (often the character-developing ones) as well as the overarching plot stories so crucial to explaining the origins of the Rebel Alliance. Thus far, season two of Rebels has featured several episodes dedicated to exploring the nuances of most of its core characters (Zeb and Chopper being the exceptions to this point), and “Stealth Strike” definitely fits that mold as it delves into the burgeoning partnership of Kanan and Rex. Forced to work together to save the captured Commander Sato and Ezra Bridger, the Jedi and the former clone trooper captain engage in a daring rescue attempt aboard an Interdictor cruiser,the latest example of Imperial ingenuity. Capable of pulling other starships out of hyperspace, the Interdictor has successfully been used by its commander, Admiral Titus, to secure Rebel starships–including one carrying Ezra. Consequently, Kanan and Rex put aside their differences (with a big help from Hera) and focus on bringing back their mutual friend. 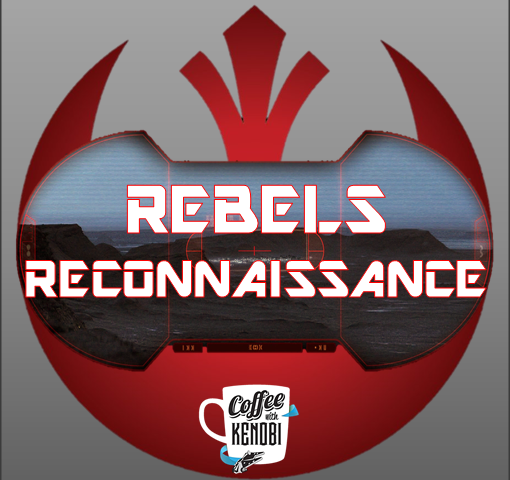 “Stealth Strike” continues the Rebels tradition of referencing the existing Star Wars universe and knitting the show into the greater fabric of the saga. Throughout this episode, the writers make blatant references to A New Hope with the general look of the environments aboard the Imperial starship, the naming of detention block AA24 (as opposed to AA23 where Princess Leia was held on the first Death Star), the inclusion of an interrogator droid, and Kanan and Rex using stormtrooper armor as the main thrust of their rescue plan. In fact, the stormtrooper armor gets quite a bit of attention as “Stealth Strike” takes repeated shots (pun intended) at some of its more notorious features. Rex complains that the armor is not as strong as the clone armor was and Kanan remarks at one point that it seems to be useless against blaster fire (a feature shown time and again throughout the classic trilogy). It’s also fun to hear Rex complain that his poor marksmanship while wearing the armor is due to the fact that (much like Luke Skywalker) he can’t see anything in the helmet. But those aren’t the only movie references. On his most recent appearance on Coffee with Kenobi, Freddie Prinze Jr. (the voice of Kanan) mentioned that the relationship between his character and Rex would take on a Lethal Weapon quality this season. “Stealth Strike” fulfills that promise by giving us a definite “Riggs and Murtaugh” dynamic, and Rex even mutters at one point that he’s “too old for this stuff.” Most importantly, the events of “Stealth Strike” bond these two together as naturally as Shane Black did in the original Lethal Weapon. Ezra Bridger’s development is also showcased in this episode as the Padawan unleashes both his developing lightsaber and blaster skills. He’s much more accomplished with the blade than he was even a few episodes ago–especially at deflecting blaster bolts and disarming stormtroopers without causing mortal damage. One could easily speculate that the next time Ezra faces Inquisitors that the results will seem more logical than the somewhat contrived ending to “Always Two There Are.” Based on the abilities he demonstrates in “Stealth Strike,” Bridger should be able to legitimately at least hold his own against the Dark Side users. Also of note in this episode is the introduction of Admiral Brom Titus, the commander of the Imperial Interdictor. While clearly thought of highly within the Imperial ranks to be given command of such a vessel, Titus seems somewhat inexperienced in dealing with rebels such as the type that make up Phoenix Squadron. Sure, he is able to capture Sato’s ship, but he severely underestimates Ezra (as does Sato for that matter) and his arrogance ultimately causes him to lose the Empire’s newest weapon. His relationship with Kallus is a tense one at the beginning of “Stealth Strike,” and the events at the end of the episode suggest it won’t get any easier for Titus. Ultimately, “Stealth Strike” is a very satisfying episode of Star Wars Rebels. There are marvelous action sequences–both aboard the Interdictor and in the vacuum of space–and the laughs are well-earned, especially during one particular sequence featuring a fight in zero gravity that combines humor and excitement seamlessly. But most of all, “Stealth Strike” seems like a natural extension of what’s transpired to this point and a turning point that sets up what’s to come.